Attention Business Managers: Don’t get ripped off by “some guy with a ladder and a spool of cable”. Not all cabling jobs are the same. The dirty truth is that we started our cabling division not because we thought we could make a million dollars. We started providing cabling because as IT professionals the quality of our work DEPENDS on having solid electrical connections, organized wiring systems, and properly labeled and documented jacks. Most cable contractors have no idea what happens with the cable after they install it. They don’t understand that higher quality cable and connectors reduce problems, increase speed potential, and are usually a 15 year investment. This means they end up using non-qualified low-voltage subcontractors that pick up the cheapest wire and connectors they can find. The fact is, dealing with a professional doesn’t cost more and will insure that you won’t have to replace your cable again in 5 years as the standards continue to evolve or because the proper tools or techniques were not used. 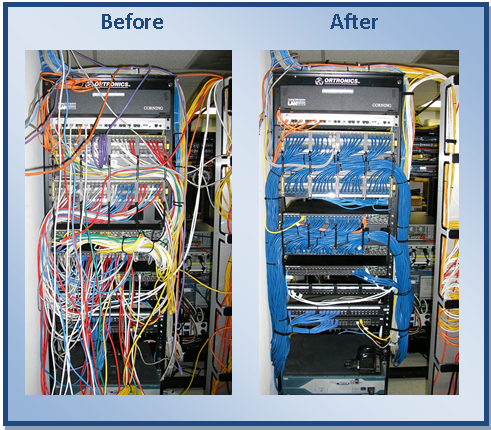 Call us today at 419-419-5737 and discover what working with a true cabling and IT professional is like. Argyle IT Solutions offers office network cabling and office moving services for businesses like yours in Ohio, Southern Michigan, Eastern Indiana, and Western Pennsylvania that need the reliability, performance, and endurance that scalability delivers. With cabling solutions that develop as your business does, you gain the confidence that comes from knowing your office is supported by a durable IT foundation. Argyle IT Solutions will deliver an expert network and cabling solution that will yield high returns from your investment as it adapts to the growing needs of your company. With service across Ohio, Southern Michigan, Eastern Indiana, and Western Pennsylvania, our team of professionals provide money-saving office cable management services that grow with your company for years to come.